So okay, this not strictly seen in retail, but if your facility is multi-store you might care for a turn of phrase that makes your signs applicable to the entire development, like this Campus Is Smoke Free With Our Thanks rendition. Part of the upper message is missing, so browse other signs below, and pick your favorite wording to fill in the blank yourself. 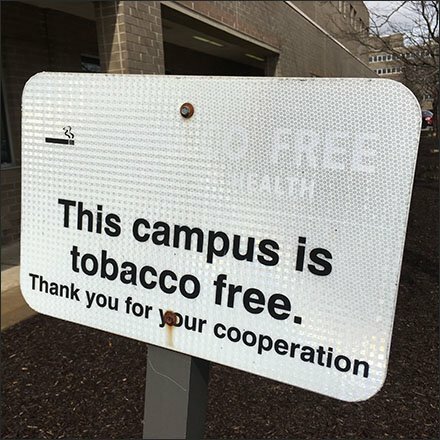 This Campus Is Smoke Free With Our Thanks seen at a Geisinger health care facility.